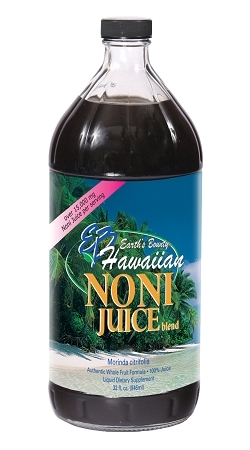 Home > All Products > Hawaiian Noni Juice - 32 fl. oz. Noni, a tropical fruit with numerous health qualities, has been used for centuries by native Hawaiians as their most important health remedy. The Hawaiian Kahunas have long regarded Noni as the sacred fruit for regenerating the body. 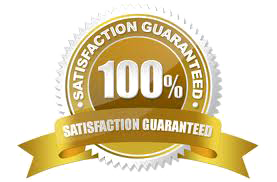 They have prescribed it as a remedy for a wide range of reasons as well as a daily tonic for general wellness. Now you can benefit from the research of modern scientists and the healing wisdom of the ancient Kahunas. To your health! Great tasting—take the Earth's Bounty taste test! 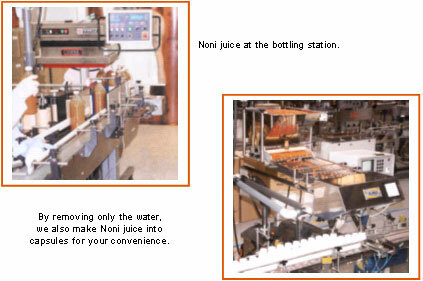 Ingredients: Noni juice, natural guava puree and natural pear concentrate. 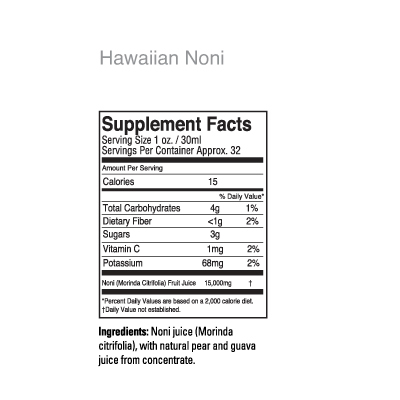 What are the active ingredients in Noni? Noni contains over 150 different compounds that work as a complex team to balance and optimize our body's functions. Some compounds, such as scopoletin and damnacanthal, have been isolated and studied individually. They have been documented to support the body in regulating the immune system and in many other activities. Noni grows well in tropical climates. 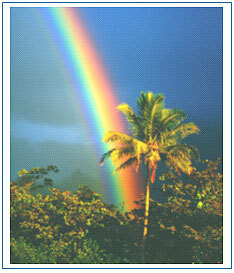 Earth's Bounty uses Noni from the pristine climates of Hawaii and the South Pacific Islands. As with other fruits, Noni should be grown in a good environment, free of pollution and pesticides, then harvested selectively for optimum ripeness. 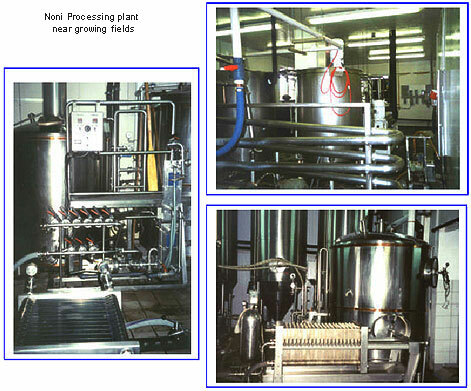 The source matters - differences between brands of Noni are likely to be the result of many factors - environment, farming techniques, harvesting methods, manufacturing processes and product formulation.